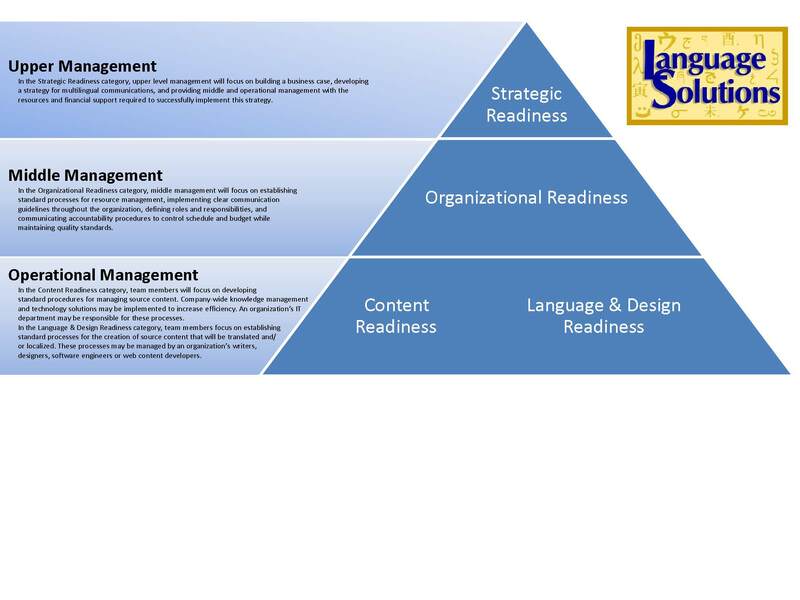 Global Readiness Scorecard | Language Solutions, Inc. 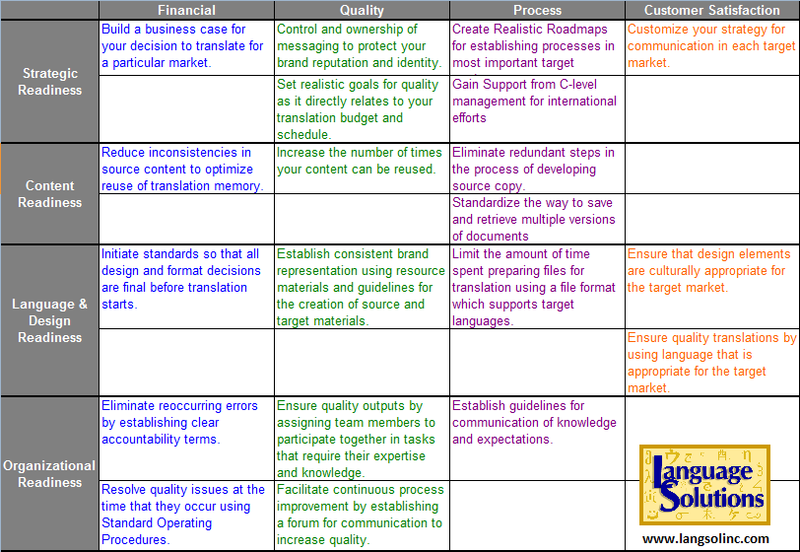 The LSI Global Readiness Scorecard™ was based on the concept of the Balanced Scorecard. This can benefit any company that wants to implement a strategy with their global communications. Our scorecard shows the various groups within your organization that each have different processes and objectives with global communications. While the objectives may be different for each area of the organization, our assessment lets you discover the commonality between the groups and identify the key indicators that can keep your organization from moving forward on the Global Communication Maturity Model™. Using our Scorecard, your organization can determine where you are on the Global Communication Maturity Model and provide you with a SWOT analysis and Measures to help you advance along the path of maturation as the volume of your global communications increase. See our matrix of objectives below. After a SWOT analysis, we can then outline a roadmap for you that has your defined objectives and metrics prioritized for where you are in your stage of growth in localization maturity. These action items will help you find process efficiencies on your end. They will also make the process of using translations transparent and help you to define key areas that will enable you to be more cost effective, affect quality, increase your own global competence and use global communications that will be tied in with your organization’s particular business objectives. Is your organization globally ready? Would you like to be? We need a new strategy. Yes, I'm interested.